You haven't heard how long notes can last until you shoulder the Schecter Hellraiser C-1 FR-S electric guitar. 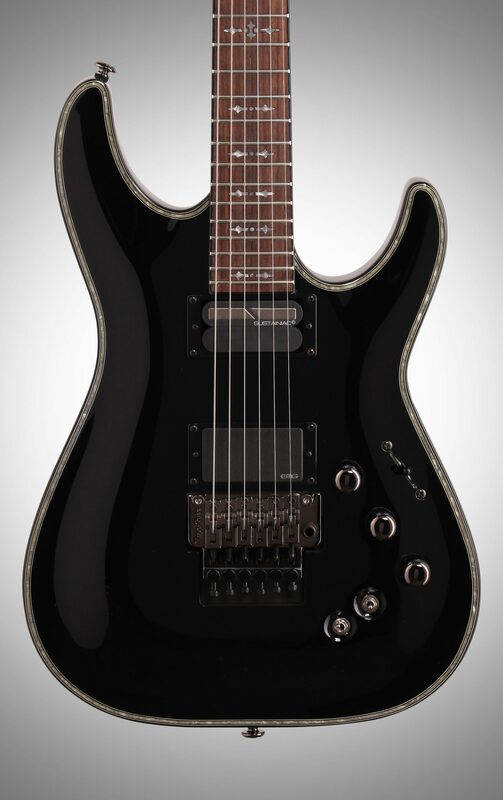 This stunning axe fuels your signal via an EMG 81 active humbucker in the bridge and a Sustainiac in the neck position, housed in a dark-sounding mahogany body. A three-piece mahogany neck harnesses razor-thin action over 24 jumbo frets in a super-smooth rosewood fingerboard, and cool dark chrome hardware, a super-flexible Floyd Rose 1000 Series bridge, and volume, push/pull tone, and intensity controls all bring you a superb speed-demon axe that's ready to unleash some sinister tone. 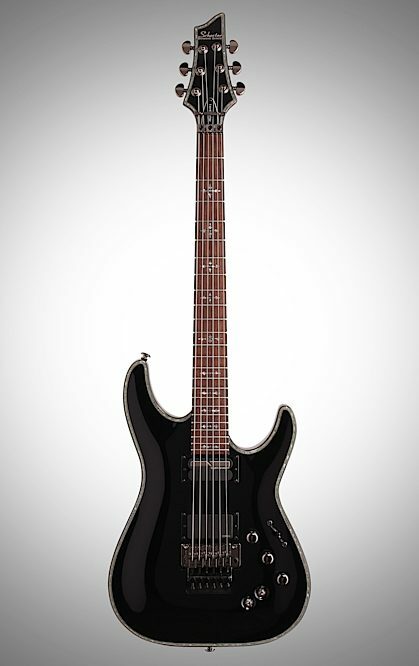 Lead fearlessly with the Hellraiser C-1's pickup complement: an EMG 81 active humbucker in the bridge and Sustainiac in the neck position. Your bridge pickup packs powerful overdrive and a full and heavy distortion perfect for rock or metal, and the Sustainiac neck pickup captures and retains an endless and spine-bending sustain from your strings via the two-way switch next to your Hellraiser's bridge. 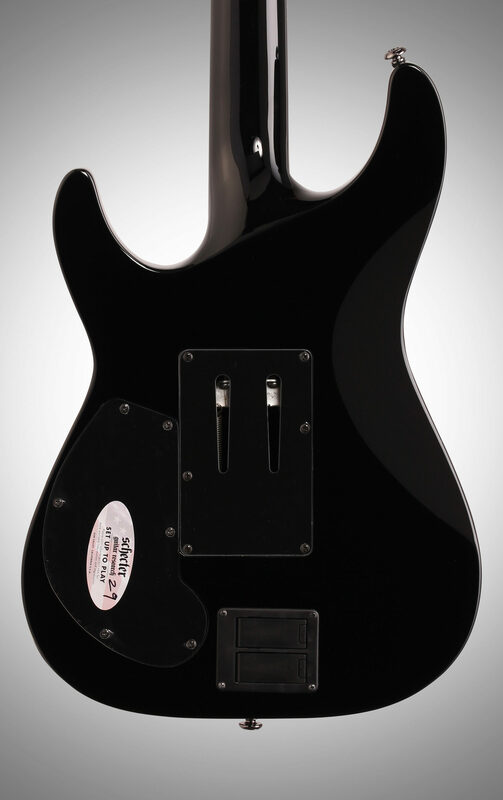 Flip the switch to kill the feedback and turn your Sustainiac into another sweet-sounding neck humbucker. Both pickups are shielded in protective casings to keep out rust, dust, and sweat, so your tone will always be clean, pristine, and uninterrupted. 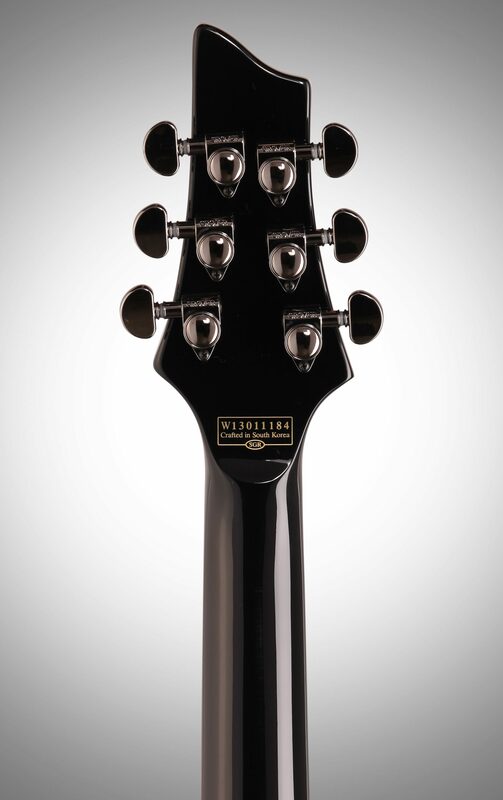 Your Schecter Hellraiser's extra-stable neck is built from three separate pieces of mahogany. This tonewood provides a dark tone to your playing, accentuating lows and mids. 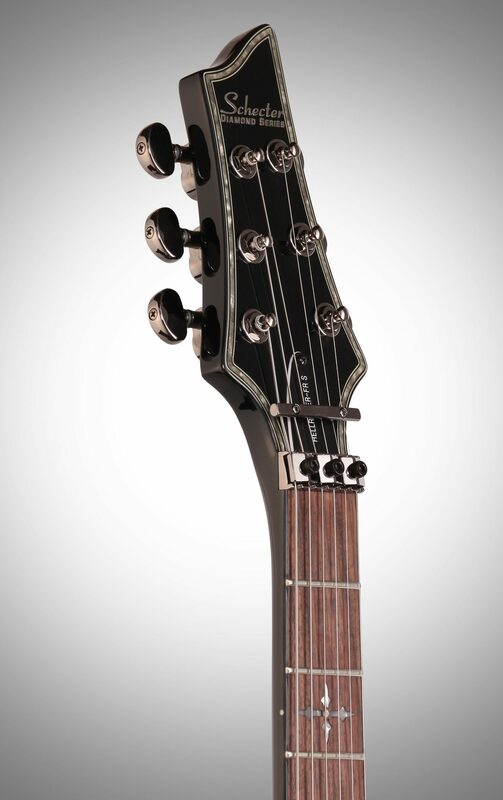 This comfy appendage features a rosewood fingerboard and 24 jumbo frets with super-close action for speedy runs. 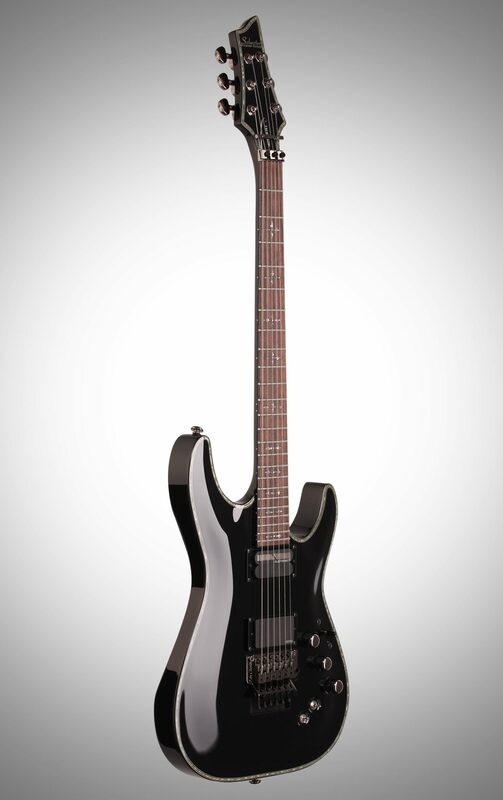 Sleek abalone gothic cross inlays offer an appealing visual edge that goes well with this axe's darker tonal character. 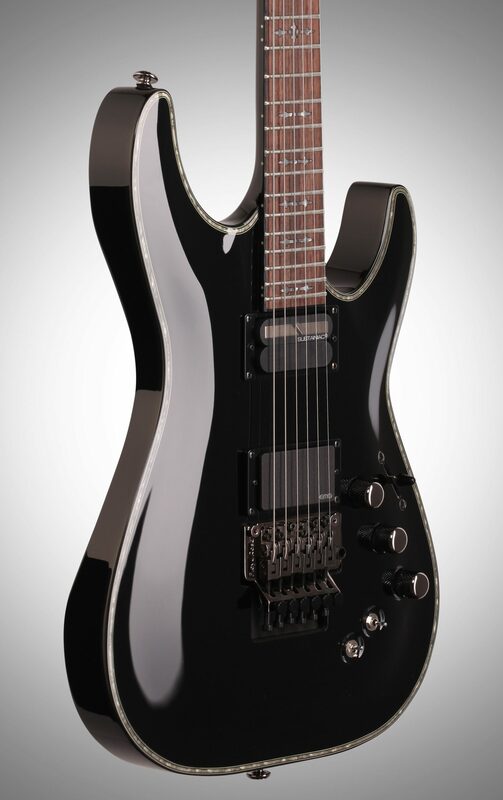 Your Schecter Hellraiser features a super-flexible Floyd Rose 1000 Series bridge. This quality piece of hardware will keep your tuning in check -- so go ahead and dive this baby as low as possible before returning your strings to their standard tensions. Use the Floyd Rose in conjunction with your sustain-engaged Sustainiac neck humbucker, and you'll create sounds that just aren't on the table with other axes! The 81 is at its best for high volume overdrive and amps giving it a razor-sharp attack, and incredible sustain for brilliant soloing. This Driver/Pickup produces beautiful Humbucker tones when Sustain switch is off, and works as the Sustainiac Driver when switched On. The Sustainiac Driver creates an infinite feedback sustain of string vibrations by electromagnetic feedback. Overall: The product is much better than I had hoped. The sustainer is incredible and the guitar is like a work of art. The guitar is fast, fast, fast and the tones are incredible. Overall: I got this baby 3 weeks ago from Zzounds....right out of the box, this guitar just totally killed, great playability, killer sound with the EMG 81 in the bridge,especially with the Sustainiac..... the Floyd Rose 1000 stays in-tune well, plus great craftsmanship, it just adds all up....it has been my number one 'go to' guitar since, I can't be any happier!! Go Get ONE! !